Why is a Chef's Jacket So Important? 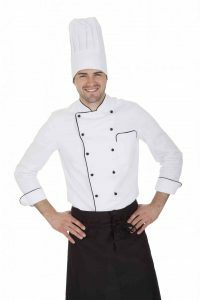 | Ace Uniform Services, Inc.
Why is a Chef’s Jacket So Important? A chef’s jacket is not just a visual indicator of status but also serves many useful purposes. An essential aspect of restaurant uniforms has been the professional chef’s jacket. Uniforms have been universally worn in kitchens of all kinds, from the highest-class restaurants to small diners. The chef’s jacket has been used for centuries to differentiate between cooks and chefs. While those on the outside and new to the restaurant industry may only see the chef’s jacket as a visual indicator of a chef’s rank, those in the know realize that it serves several useful purposes. The most important design aspect of a chef’s jacket is to keep the wearer safe. It is made of high quality, usually fire-resistant cotton. The dangers in a professional restaurant’s kitchen are ever present. The emphasis on speed can lead to a lot of accidents. You could stand too close to an open flame or open a pot too quickly and be met by a burst of hot steam. A chef’s jacket won’t protect you completely from injury, but it can act as an effective shield against some of the dangers inherent in a fast-paced kitchen environment. Cleanliness is godliness in a restaurant, and a clean image is critical to getting your customers coming back again and again. Traditional chef’s coats are double-breasted in design, so if you find that you’ve spilled something on yourself, you can simply unbutton your jacket and switch the stained layer with the fresh one. Your diners won’t even know that you’ve got stains on your jacket. Another critical aspect of being a chef is projecting the right image to your coworkers and your customers. A high-quality chef’s jacket signals that the wearer is a professional that takes their profession seriously. It reflects well on your work as well as builds on the reputation of your restaurant. A chef’s jacket tells the world that you take pride in your work! It is a must-have in all high-end kitchens, and once you’ve started wearing one, you won’t know how you went without it! This entry was posted on Wednesday, December 14th, 2016	at 2:09 pm	. You can follow any responses to this entry through the RSS 2.0	feed. Both comments and pings are currently closed.